At the heart of Delft market square is a landmark that links directly to the country’s royal past. The Nieuwe Kerk (New Church) on the Markt is where William of Orange (or William the Silent) was entombed in 1584 and since then all members of the House of Orange-Nassau have been buried in its royal crypt – the latest burials took place in 2004 when Queen Juliana and her husband Prince Bernhard were buried here. When William of Orange took up residence in Delft in 1572, that began the town’s association with the House of Orange. He originally served in the court of the governor of Spanish Netherlands but became unhappy at the Spanish persecution of Dutch Protestants and decided to join the Dutch uprising. During the Eighty Years’ War or Dutch War of Independence, William of Orange was successful in ousting the Spanish armies from the northern provinces and he established the Republic of the Seven United Netherlands. During this period Delft was one of the leading cities of Holland. The people of Delft are naturally very proud of their town’s association with the House of Orange, in particular William of Orange, the man accredited with giving the Dutch their freedom from Spain. 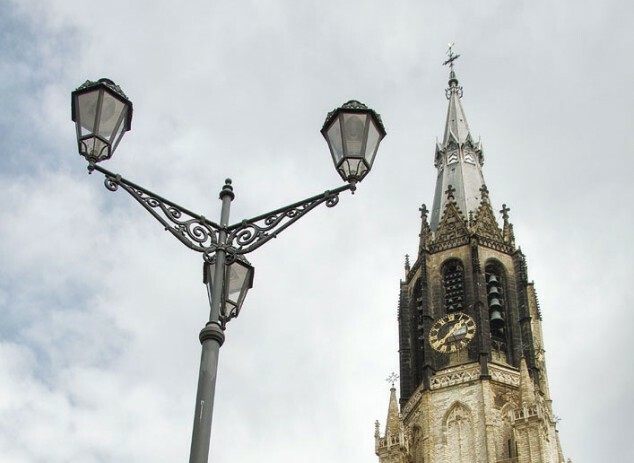 However, it was by pure chance that William of Orange came to be buried in Delft instead of the Grote Kerk in Breda, where his ancestors were buried. When he was assassinated by Balthasar Gerard in 1584, Breda was still under Spanish control and William could not be buried there as he had been declared an outlaw by the Spanish king. The original tomb in Delft Nieuwe Kerk was a modest one but it was subsequently replaced by the impressive four-poster marble mausoleum that is in the church today. In the royal crypt are the bodies of 46 royals, each one with a story to tell about the Dutch royal family and the country’s history. The crypt is not open to the public, but if you’re standing at William of Orange’s mausoleum, his body and those of ten of his closest relatives are buried directly under the mausoleum. Being Delft Blue Day, the church was closed and we didn’t get to see the interior or climb the church tower, which at 108.75 metres high makes it the second tallest tower in the Netherlands. 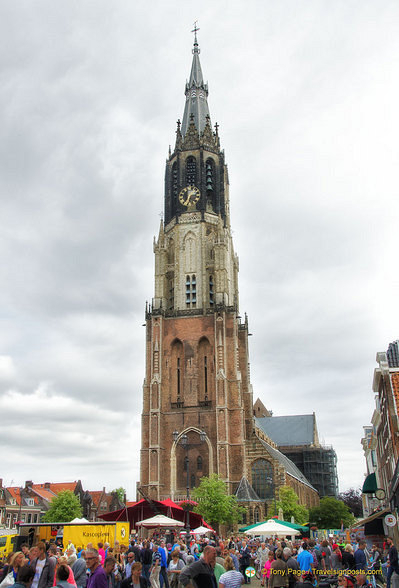 You can climb to the balcony of the tower for a bird’s eye view of Delft and its surroundings, but be prepared to climb 376 steps.